In the past years, fiber composite materials have gained importance. A classical manufacturing process is filament winding. During this process, continuous filaments are impregnated with the matrix material, for instance, an epoxy resin, and then wound onto a positive, rotating mold core in a pre-defined pattern. The advantages of this type of process consist in the high strength of the material, its small weight, and simple processing. The joint of two or more components that may also be made of different materials, however, represents a rather weak point. Rivet joints or screws damage the fiber structure of the components to be joined. Bonded joints are characterized by largely varying strengths and stiffnesses and, hence, are not suited for a reliable connection. Scientists of the KIT have developed the component-generating process of wet filament winding further for joining. The new approach is based on using the components to be joined as a core around which an impregnated roving is wound. In contrast to conventional winding, closed frame structures or large components are always associated with the risk of collision. For this reason, a special robot-controlled kinematic system was developed. It consists of a C-shaped stator fixed to a robot. In this stator, an also C-shaped rotor rotates. The winding unit rotates around the components to be joined and, at the same time, winds the continuous fiber around the joint. The knot connection at the joint of the components has a small weight. It does not damage the components to be joined and reaches a very high strength and stiffness. 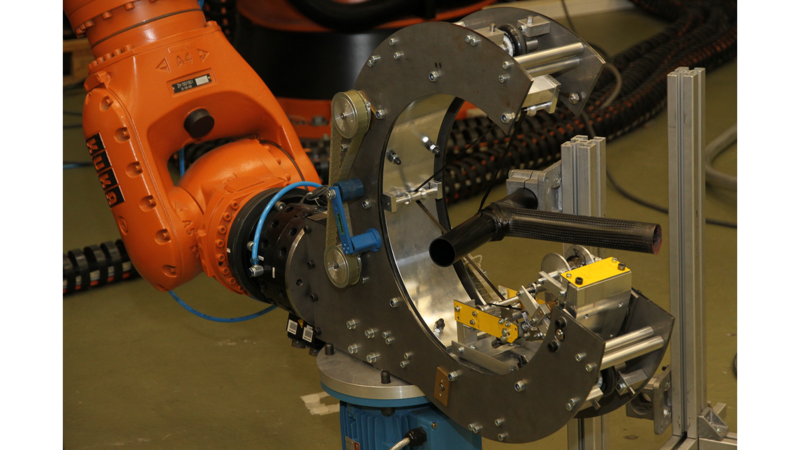 A prototype of the kinematic system is being applied by wbk and can be inspected.